Columbus, OH – SEMM Foundation and the future Jazz 98.5 FM, WSAX-LP radio station announces and proudly presents The Jazz Brew Concert Series Classic Big Band Jazz Orchestras at the Walter Armes Learning Center Auditorium at Whitehall-Yearling High School. The final installment of the 2015-2016 Jazz Brew Concert fundraising concert series is scheduled for 6:30 pm, Saturday, February 20, 2016. 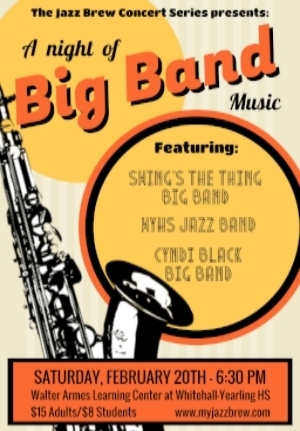 Appearing that evening will be two of Central Ohio’s renowned classic jazz big band orchestras, Swing’s The Thing Big Band and The Cyndi Black Big Band, along with the talented Whitehall-Yearling High School Jazz Band, conducted by band director Josh Cutting. Swing’s the Thing Big Band is a 16 piece big band based in Central Ohio, playing hits from a variety of new artists, while respecting the origins of big band by playing tunes from the books of, but not limited to, such legends as Count Basie, Glenn Miller, Duke Ellington and Woody Herman. Swing’s the Thing’s repertoire covers a wide range of dance styles that include swing, rock, ballads, blues, cha cha, rumba, mambo, samba, waltz, disco, foxtrot and polka. Swing’s the Thing features their vocalist and pianist, Jan Schlosser-Wise, on a variety of great charts. The Whitehall-Yearling Jazz Band is a select jazz ensemble of mixed instrumentation whose musicians are selected through an audition process that takes place every spring. Students perform in a variety of classic and modern jazz idioms. The band performs multiple concerts per year and schedule permitting, attends a jazz festival in the Central Ohio area. Tickets are on sale now. Ticket prices are $15 for Adults and $8 for Students. Seniors 60 and over are admitted free. Tickets and more information for the February 20th concert are available online at www.myjazzbrew.com or www.eventbrite.com. Ticket purchases help support SEMM Foundation’s music education programs and the final construction and future operations of the new 24 hour non-commercial Jazz 98.5 FM, WSAX-LP radio station. The Walter Armes Learning Center Auditorium at Whitehall-Yearling High School has been a host venue for three previous Jazz Brew concerts with stellar Straight-Ahead, Smooth Jazz and Jazz Fusion performances by notable musicians such as The Bobby Floyd Trio, The Dwight Lenox Trio, Priscilla Woodson, Mary McClendon, The Linda Dachtyl Quartet, The James Gaiters Quartet, The Urban Jazz Coalition, The Broadstreet Lineup and The Tim Dvorkin Trio.